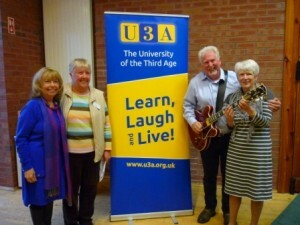 The University of the Third Age (U3A) has been growing fast in Northern Ireland, with around 6,500 members among the older community in Northern Ireland and this success was celebrated at their recent Autumn Regional Meeting in Grosvenor Hall Belfast. The October meeting began with a talk by Michaela Moody, vice-chairman of the Third Age Trust who highlighted the ever-increasing demand for the educational and social experiences provided at very low cost by U3As. She noted that, although membership in Northern Ireland is growing by around 10% per year, still there are many retired people who are unaware of U3As. Participants at the meeting shared their U3A experiences in a workshop before being entertained by a talk from Colum Arbuckle whose Sunday afternoon Radio Ulster programme has drawn from U3A membership to highlight how retirement has provided “Times of our Lives”. U3A is a learning and social organisation open to all retired or semi-retired men and women, recognising the talents of older people and allowing them to meet others with similar interests and to share their knowledge and skills. There are now 24 U3As across Northern Ireland, with Ballymoney U3A the most recent, ranging in size from 35 to over 1,000 members. Each U3A has its own programme of learning, health and social activities for its members and they come together twice a year in a regional meeting.